Deep in the heart of Jakarta’s slums lies an impenetrable safe house for the world’s most dangerous killers and gangsters. Until now, the run-down apartment block has been considered untouchable to even the bravest of police. 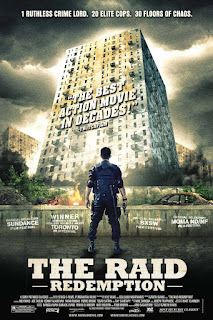 Cloaked under the cover of pre-dawn darkness and silence, an elite swat team is tasked with raiding the safe house in order to take down the notorious drug lord that runs it. But when a chance encounter with a spotter blows their cover and news of their assault reaches the drug lord, the building’s lights are cut and all the exits blocked. Stranded on the sixth floor with no way out, the unit must fight their way through the city’s worst to survive their mission. Starring Indonesian martial arts sensation Iko Uwais.